Currently, the Soseh Kindergarten is operating from a temporary location—Stepanakert’s #6 School building—with 70 students. That number is expected to grow with the new facility. 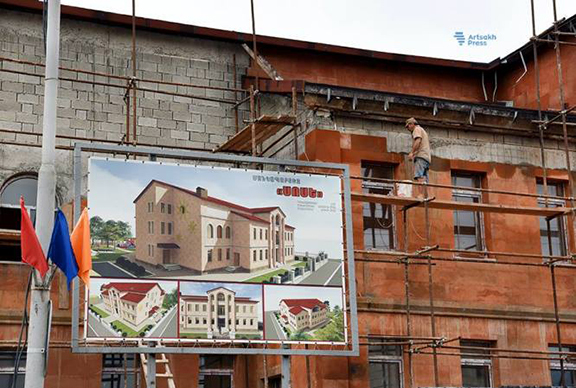 The Armenian Relief Society-sponsored Stepanakert “Soseh” Kindergarten will re-open its doors for a new school year on September 6, announced Artsakh’s Urban Development Ministry’s state executive Davit Avanesyan, adding that the construction, which began in August 2015 will be completed shortly. “Currently work is being done on the interior of the kindergarten building, as well as the revamping of the schoolyard,” Avanesyan told Artsakh Press. ARS regional bodies continue to raise funds for this project, which is sponsored by the ARS Central Executive. One such event took place on June 4 when supporters gathered at the residence of Mr. & Mrs. Harout and Vicky Marashlian for a luncheon and raised over $33,000 to benefit the ARS Stepanakert “Soseh” Kindergarten and the purchase of a number of necessities for the kindergarten, including children’s bedding and furnishings. Among the 80 guests were ARS Central Executive Board Vice-Chairperson Nyree Derderian; ARS Central Executive liaison to the Western Region Maral Matossian; Regional Executive Board Members Carmen Libaridian and Maro Papazian; Jackie Hawley, Jane Karageorge, and Catherine Yesayan of Sorptimist International of Glendale; Lynda Burns of the Glendale Commission on the Status of Women; previous ARS Regional Executive Board chairpersons, chapter representatives, and donors. The official re-opening ceremony of the ARS Stepanakert “Soseh” Kindergarten will be held in Artsakh on September 6, 2017. ARS regions from around the world have joined the rebuilding project initiative to help ensure that the kindergarten will continue to provide early childhood education in a nurturing environment. While the project turned into reality thanks to the government of the Artsakh Republic, which allocated the land for the kindergarten to the ARS and contributed to construction costs, the Armenian Relief Society has undertaken the greatest of responsibilities in the rebuilding project. In an effort to ensure the smooth progression of the project, the ARS Central Executive Board formed a committee, which focused on fundraising for the project through events and programs throughout the Western and Eastern United States and Canada. ARS members Jasik Jarahian, Seda Khojayan, and Vicky Marashlian represent the Western Region on the ARS Stepanakert “Soseh” Kindergarten Rebuilding Project Committee. As a result of their dedication, the ARS of Western USA has brought its maximum participation to the rebuilding project. During the event, each of the three committee members delivered remarks to guests, explaining the progress and goals of the rebuilding project. While this event may be one of the last ones in the region to benefit the project, the ARS of Western USA extends its utmost gratitude to all the supporters, who have helped further this cause.